Reading Football Club can confirm that Norwich City striker Nélson Oliveira has completed loan paperwork that will see him represent the Royals until the end of the 2018-19 season. 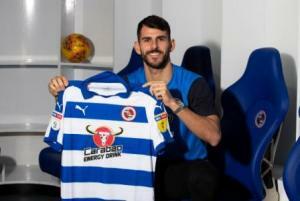 The 27-year-old Barcelos-born forward will take shirt number 22 at Madejski Stadium and will train with his new teammates for the first time tomorrow ahead of a possible first team debut at Bolton next Tuesday. The City striker began his career in his home district of Braga, coming through the ranks with Santa Maria and SC Braga before joining Benfica at the age of 15. The 6’1” striker’s professional debut came on loan at Rio Ave (a club which some time later was managed by Royals boss José Gomes of course) with a substitute appearance in a 2-0 home win over Leixões in February 2010 – and he spent the following season on loan at fellow Primeira Liga side Paços de Ferreira, scoring on debut against Maritimo. In October 2011, he earned his debut for Benfica in a domestic cup win over Portimonense and that same season he played Champions League football at the Estádio da Luz, coming off the bench to score against Zenit Saint Petersburg and help his club qualify for the last eight of the competition. Having started in a Portuguese Cup Final-winning side that included the likes of Javier Saviola, Pablo Aimar, Nemanja Matic and Nolito, he left Lisbon for Spain and a loan move to Deportivo La Coruña – and Oliveira scored on his La Liga bow in a home win over Osasuna. He spent 2013-14 with French side Stade Rennais where he played in front of a packed Stade de France in the Coupe de France Final against Guingamp. And his loan experience continued to expand as the striker arrived in the UK for the first time when he joined Swansea City in December 2014. His first minutes as a Swan came as a late substitute for former Royals hero Gylfi Sigurdsson in a draw with West Ham at the Liberty Stadium – and he opened his Premier League account in a dramatic 3–2 away win at Newcastle United. The following year, Oliveira returned to the UK to play for Nottingham Forest on loan in the Championship. Again, he scored on debut, in a 2-1 win over QPR at Loftus Road. Netting the winner in an East Midlands derby saw Forest fans fast warm to the frontman and Royals fans may recall the Portuguese international firing a fine brace past Ali Al Habsi at the City Ground in November 2015. It wasn’t his only success against the Royals – as the Canaries no.9 in 2016-17 he scored in both home and away fixtures between Reading and Norwich, with whom he has bagged a total of 20 goals in 46 starts since signing permanently for the Carrow Road outfit. On the international scene, he represented Portugal at various youth levels – notably scoring against Brazil in the FIFA Under-20s World Cup final in 2011. His senior debut came the following year, when Nélson came off the bench to replace Nani in a friendly draw with Poland. He was part of the Portugal squad that reached the semi-finals of Euro 2012 and he has scored twice for his country in accumulating 17 caps to date.